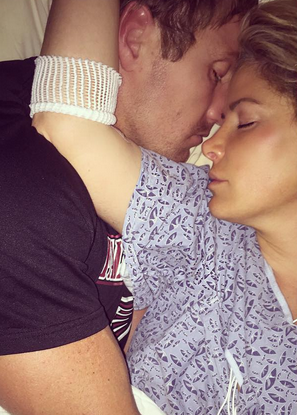 Kim Zolciak suffered a mini-stroke after a flight from LAX to Atlanta last night. Kim had just finished filming a horrendous dance sequence for Dancing With The Stars, and was rushing back home to be with her family. Minutes after arriving at home, she suffered the stroke which left her completely numb on the left side of her body, and unable to talk. Kim is obviously feeling better now, because she's able to update her status on social media. She also says she will be released from the hospital today. 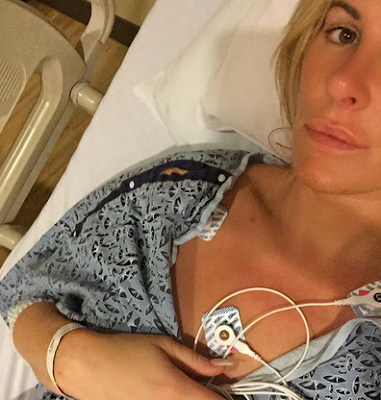 The former Real Housewives of Atlanta star isn't sure what caused the stroke, but she thinks a Monday Botox injection may have been the culprit. Everybody knows Kim has been effin with her face. She has that puffy, Kardashian-face thang going on. Maybe her husband needs to encourage her to stop putting foreign substances in her body. Bytch ain't even 40 yet, and she's already chockfull of silicone and fix-a-flat. And cut back on the damn cigarettes and liquor. This woman is living like she has a death wish. Oh, and let's not forget how Kim lied about having cancer on season one of Real Housewives. Now, I'm not saying she's lying about the stroke, but I'm gonna need to see the receipts before I can feel somewhat sorry for her. Don't even get me started on these dumb azz hospital photos.